The FSD series of pulse jet filters are an economical and popular choice. The filter media is cleaned by short pulses of compressed air controlled by a programmable solid state timer. The side door removal of filter media allows the FSD to be installed in areas with limited headroom. 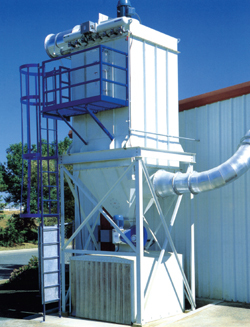 Applications include wood chip and sawdust, agricultural products, chemicals, cement and rock crushing.